Tweet Scoop: The pilot episode of "Forevermore" happened few hours ago and I can say that it caught the attention of the televiewers and netizens, not only because of its wonderful cast of actors and actresses, but also because local celebrities supported it all the way, including the DLSU King Archer Jeron Teng. It was as if the universe conspired to make it a trending topic on Twitter a while ago. 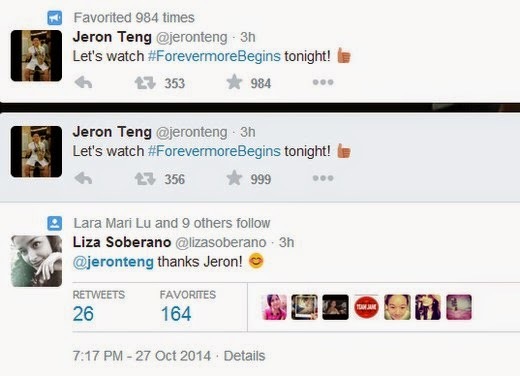 The leading lady in the TV Series Miss Liza Soberano thanked Jeron via Twitter for showing his support to the show.